Friday, July 17 1908 -- Professor James H. Hoose of USC came to town to offer a talk on baby psychology. He says that the various sounds babies make all have very distinct meanings, and that mothers can do a better job of parenting by learning to decode these sounds. Correct or not, the professor certainly left himself wide open to a bit of Herriman mockery. Connie, January 3 1937, courtesy of Cole Johnson. Winfield Frank Smith was born in Wallaceburg, Ontario, Canada, on January 22, 1888, according to his World War I draft card at Ancestry.com. Information regarding his education and art training has not been found. The 1910 U.S. Federal Census recorded Smith, his parents, Frank and Belle, and brother, Melville, in St. Paul, Minnesota on Grotto Street. Jewelry engraver Smith, his watchmaker father and brother emigrated in 1906. Smith’s mother was born in New York. On June 5, 1917, Smith signed his World War I draft card. His address was 1013 Rivereen in Santa Ana, California. Married with two children, Smith was a self-employed jeweler who had declared his intention to naturalize. The description of him was tall and stout with brown eyes, black hair and slightly bald. According to the 1920 census, Smith was married to Mae and had two daughters, Dorothy, 6, and Dawn, 5. They resided in Santa Ana at 1125 West 2nd Street. 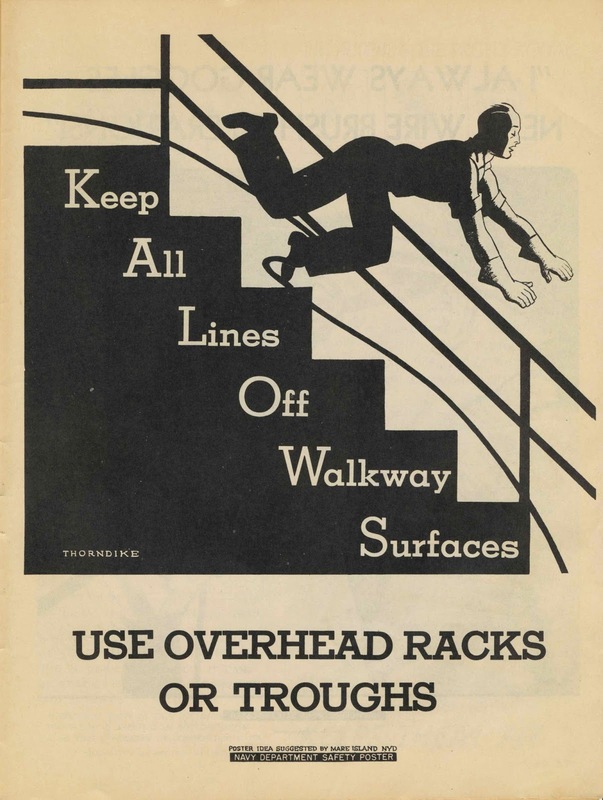 Smith was an advertising cartoonist. In the 1921 Santa Ana city directory listing, Smith resided at 1048 West 5th Street and worked at 313 West 4th Street. Charles Solomon’s Enchanted Drawings: The History of Animation (1989) revealed Smith’s important contribution at Disney. According to Diane Disney Miller, “Three Little Pigs” was also the first cartoon to have a complete storyboard. Originally devised by Win Smith, Iwerks’s former assistant, the storyboard consisted of a series of small drawings and captions pinned to a corkboard wall that showed the action of the film. Preliminary sketches and comic book-like plans had been used on many earlier films. Pinning the drawings to a wall enabled the artists to add, remove or change sketches and to see easily how various sequences within the film related to each other. The storyboard represented Disney’s solution to the problem of bringing order and structure to the animated short…. He said, “No young whippersnapper is going to tell me what to do,” and he walked out of the studio into oblivion. So Walt called me in and asked if I’d take it over. 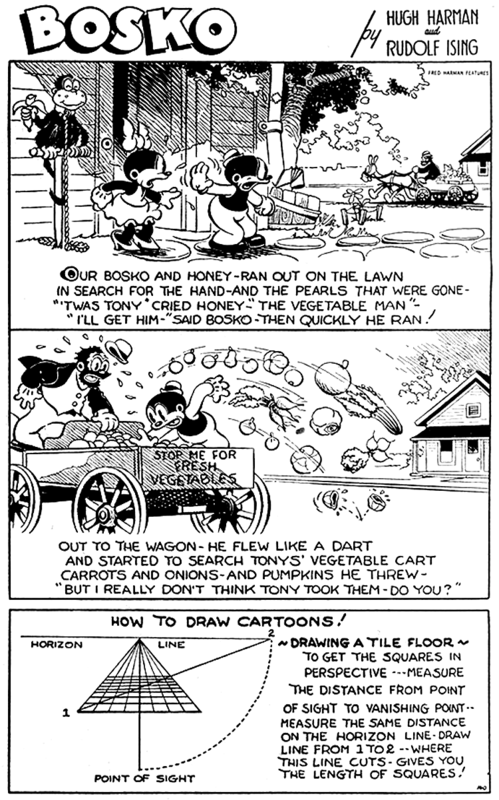 Gottfredson drew the strip for the next forty-five years. According to American Newspaper Comics (2012), the Mickey Mouse daily strip began January 13, 1930. Smith inked Iwerks’ pencils through February 8. 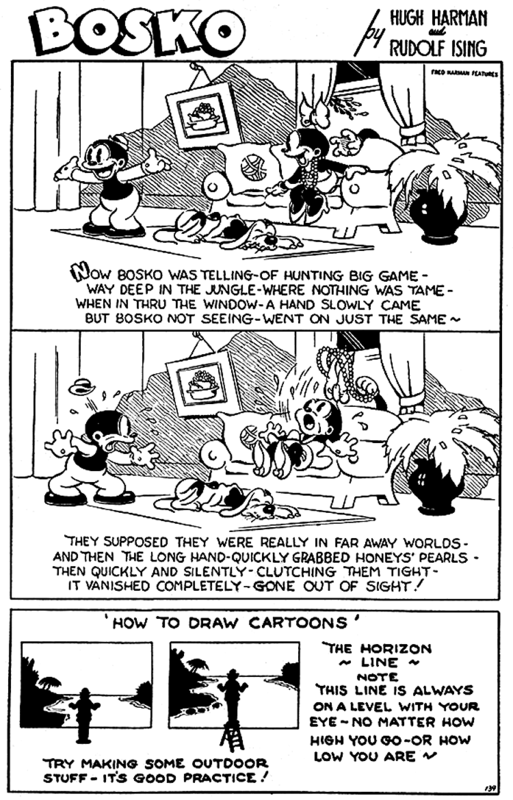 Iwerks returned to animation, and Smith did the pencils and inks from February 10 to May 3, 1930. 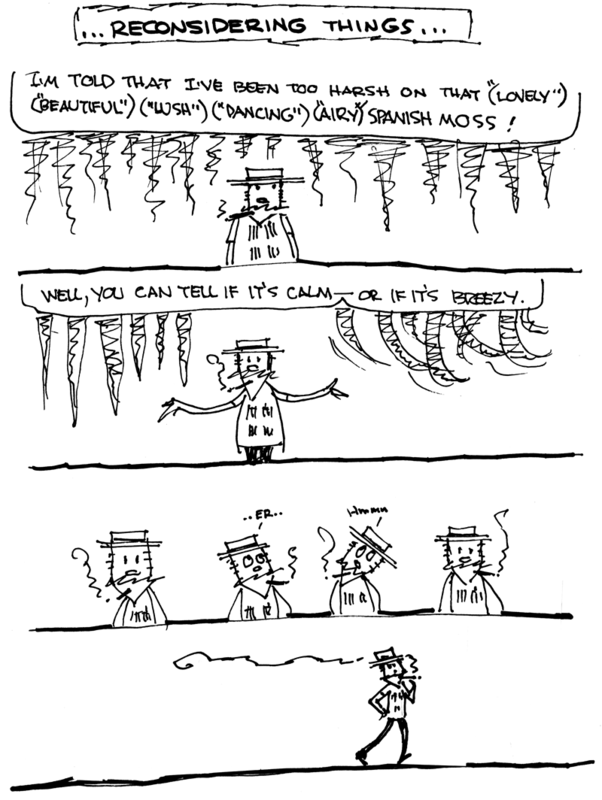 The original art for one of the strips is here. After Disney, Smith ghosted the Rudolph Ising and Hugh Harman series Bosko, which appeared in 1934 and distributed by Hugh’s brother’s, Fred Harman Syndicate. Samples can be viewed here. In the late 1930s, Smith wrote stories for the Walter Lantz studio and drew comic book stories for Dell Publishing. Some of those Dell comics were published after Smith’s death. The 1940 census recorded Smith, divorced, and his two daughters, in Los Angeles at 4611 Finley. Smith was a naturalized citizen and self-employed cartoonist in the publishing industry. The highest level of his education was the eighth grade. His youngest daughter, Dawn Ashworth, also divorced, was an animation painter. Some sources said Smith was an art teacher at Phoenix High School in Arizona. If true, then it was a short career. Smith passed away October 8, 1941, in Los Angeles, California, according to the California Death Index at Ancestry.com. An obituary has not been found. Smith was buried in Glendale, California. As far as I know, it was Webb Smith, not Win, who came up with storyboards at Disney. If Diane Disney Miller ever mentioned Win, I guess she was wrong. 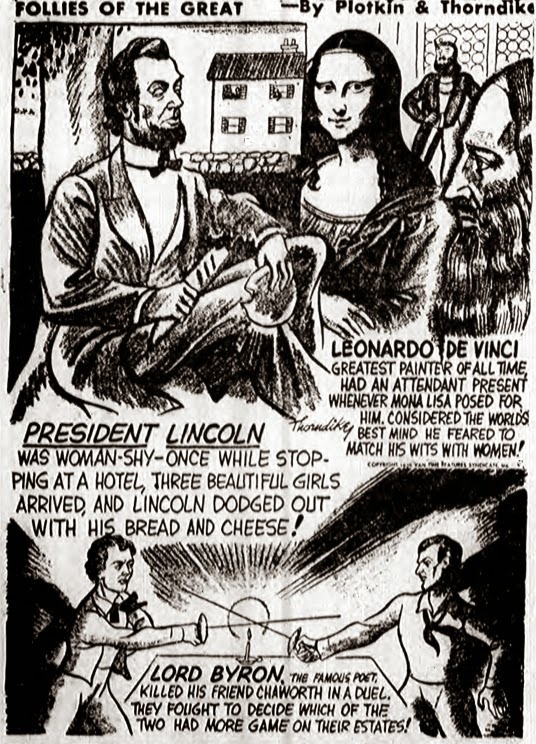 The New York Herald produced some lovely magazine cover comic series in the teens, in an era before the form became ubiquitous. Here's one of the most visually striking of them all, The Jump-Ups. It ran from February 4 to August 11 1912. William H. Loomis produced several of these Herald series, but this is his best in my opinion, though another one, The Widow Wise, was more widely appreciated at the time. The above example should be enough to prove that Loomis' facility for both comedy and drama in a drawing was amazing. Unfortunately Loomis didn't get a chance to produce as much of his delightful work as we would like, as he died at age 46 in 1917. Doggerel verse for this series was provided by Paul West, whose naive cartooning we were thankfully spared. Unfortunately his versifying is, in my opinion, just as grating as his art. The subject of a nouveau riche family trying to make a splash socially could have been fun, but slogging through West's versification is enough to tax anyone's patience. Just look at the delightful pictures, that's my suggestion. Charles Jesse “Chuck” Thorndike was born in Seattle, Washington, on January 20, 1897, according to “Washington, Births, 1883-1935” at Ancestry.com. His parents were Charles Adelb Thorndike and Hortense Victoria Davis. In the 1900 U.S. Federal Census, Thorndike, his parents and paternal grandmother resided in Seattle at 1729 Fourteenth Avenue. His father was the treasurer of cereal company. In the next census, the Thorndikes remained in Seattle at a different address, 2441 Federal Avenue. Thorndike’s father was a cashier at Brewing and malt company. Thorndike enlisted in the Marine Corp January 26, 1918. He was a private in Company E, Marine Barracks, Navy Yard, Mare Island, California. Thorndike’s Seattle address was the same in the 1920 census. His father was a real estate salesman. In the household was two boarders and one of them was Frank R. Wolfe, a newspaper artist. Artists in California, 1786-1940: L-Z (2002) said Thorndike resided in San Francisco from 1921 to 1922. Who’s Who in American Art, Volume 7 (1959), said Thorndike studied at the the Seattle Art School, the University of Washington, and the California School of Fine Arts.Thorndike married Edythe Mae Armstrong October 3, 1923, according to the marriage certificate at Ancestry.com. At some point, they moved to New York City.The 1930 census recorded the couple and their daughter in Newport City, Queens, New York at 3448 Eighty-third Street. His occupation was oil painting artist. 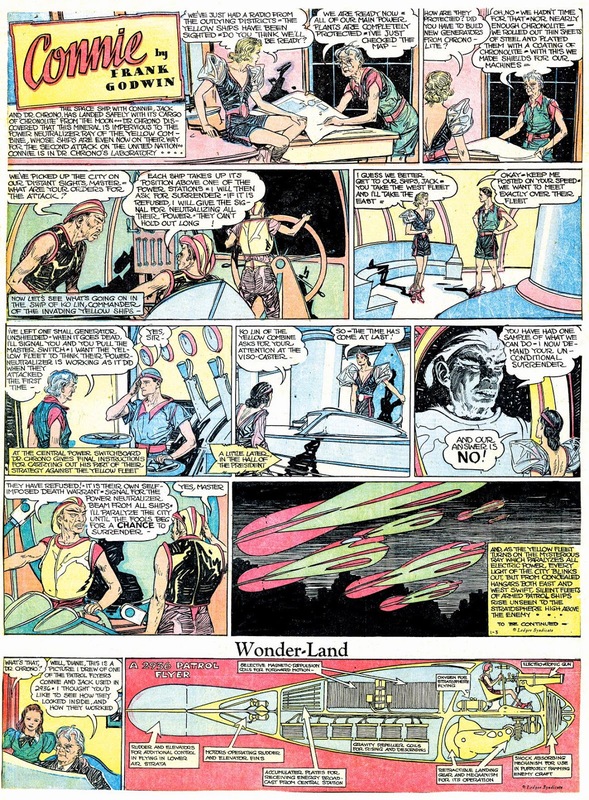 American Newspaper Comics (2012) said Thorndike drew the panel Follies of the Great which was written by Dave Plotkin. Their work was syndicated by Van Tine Features, who owned the copyright. The Van Tine Features comics were announced, with much fanfare, in the West Seattle Herald, (Washington), June 18, 1936, and the Hastings News (New York), January 10, 1936 (below). The panel began in 1935 and ended in 1937. 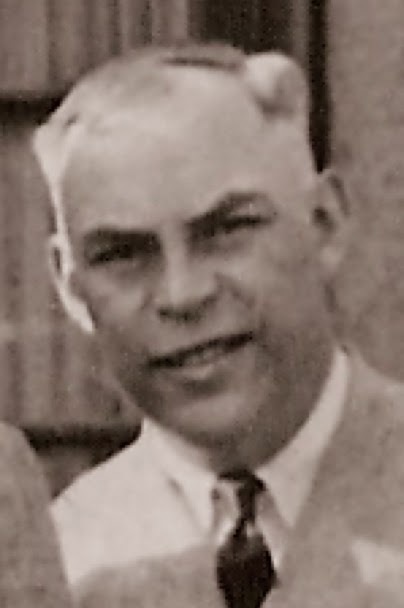 Who’s Who of American Comic Books 1928–1999 said Thorndike worked at the Eisner and Iger comics shop in 1936, and did animation at the Loucks and Norling Studios. Thorndike moved around 1939. He lived in San Francisco, California, at 845 O’Farrell Street, according to the 1940 census. He was a newspaper artist and writer, who had re-married to Ann Lee, a stenographer. 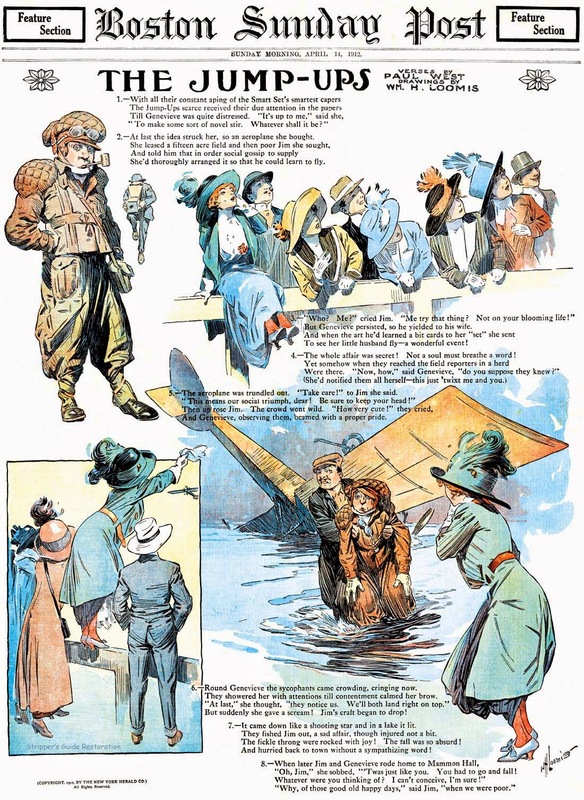 Who’s Who said Thorndike was art director of animated cartoons for an advertising agency in San Francisco; art director at General Motors Acceptance Corp., New York; in the U.S. Navy (Civil Service), Washington, D.C.; and a radio commentator on the Cartoon Club of the Air, New York. Radio listings in the New York Post and Brooklyn Daily Eagle said the program was on WNEW in 1938 from January to May. 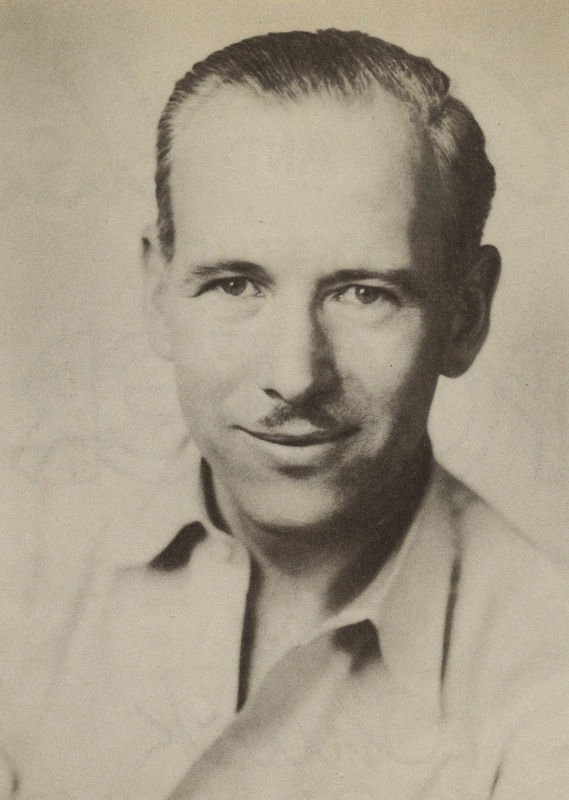 Thorndike authored a number of books: The Secrets of Cartooning (1936), Art of Cartooning (1938), Business of Cartooning (1938), Drawing for Money (1940), Are You a Doodler? (1940), Life Drawing and Anatomy (1940), Seeing America the Easy Way (1941), Arts and Crafts for Children (1942), The Art and Use of the Poster (1945), Oddities of Nature (1947), Susie and Sam in Rock City (1948), and New Secrets of Cartooning (1955). Thorndike’s letter to the Miami News was published March 8, 1960. Thorndike passed away March 22, 1986, in Dade County, according to the Florida Death Index. I am Chuck Thorndike's grandson. You have lots of good information except that his first wife was Kathryn Lesser from Seattle, where they met. They were married in Vancover, BC. They had one daughter, Barbara Ann who was born in Yonkers, NY July 26, 1927. They lived in the artists' community of Silvermine, Connecticut until they were divorced in 1935. December 5, 1938 Chuck Thorndike wrote a letter to President Roosevelt. Warns President Roosevelt that "we old line gentile American families will NOT tolerate the JEWS... We would first rather give up our lives." Also contends that "Hitler...isn't so wrong." David George “Dave” Plotkin was born in New York City in April 1899, according to the 1900 U.S. Federal Census. He was the youngest of four children born to Louis and Sarah, both Russian emigrants. The family resided in Manhattan at 254 Madison Street. The Brooklyn Standard Union, June 30, 1926, said Plotkin was born on Henry Street. In 1910, Plotkin was the fourth of seven children. His parents and siblings lived in Brooklyn at 331 Sackman Street. The 1915 New York State Census recorded their address at 317 Sackman Street. Plotkin was unemployed according to the 1920 census. The entire Plotkin household remained in Brooklyn but at a different address, 578 Cleveland Street. The Brooklyn Standard Union, September 7, 1923, published a list of the 167 people who passed the state bar exam which included Plotkin, who resided at 509 Elton Street. I had just completed a three year's course at law school, studying the Elizabethan playwrights and reading the Russian novelists, and after being admitted to the bar of New York State, I became a Rube Goldbergian comic strip artist and columnist. Plotkin has not been found in the 1930 and 1940 censuses. In the Church Notices section of the New York Evening Post, January 10, was an advertisement for the Community Church, Park Avenue at 34th Street, which had three events scheduled. At five o’clock was a poetry reading by Plotkin. In 1934 he collaborated with Otto Soglow on the book, Wasn’t the Depression Terrible. The dust jacket is here, and several pages are here. 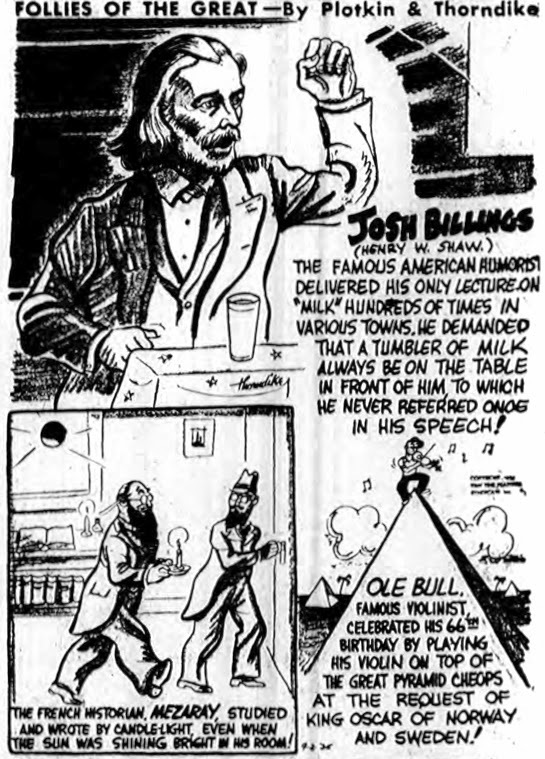 The following year, Plotkin and artist Chuck Thorndike produced Follies of the Great which was syndicated by Van Tine Features, who owned the copyright. The Van Tine Features comics were announced, with much fanfare, in the West Seattle Herald, (Washington), June 18, 1936, and the Hastings News (New York), January 10, 1936 (below). 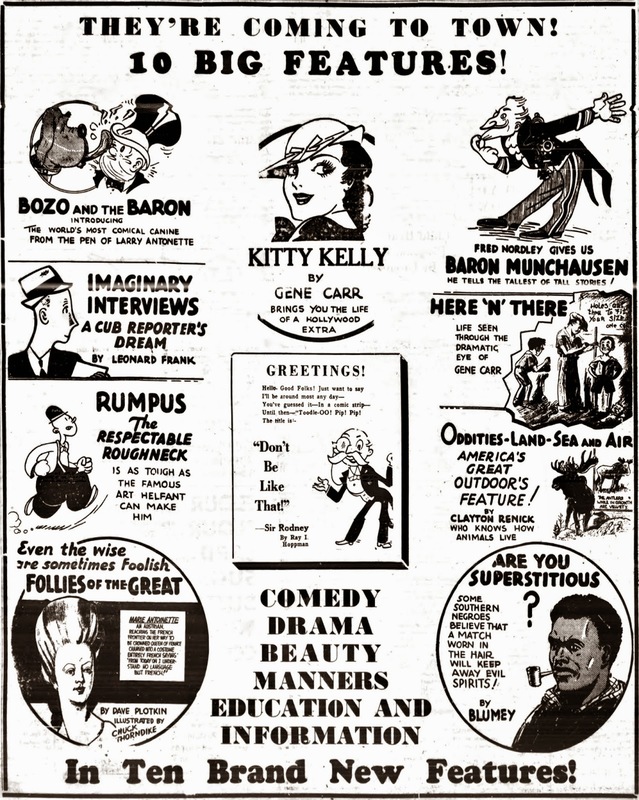 American Newspaper Comics (2012) said Follies of the Great ended in 1937. Surviving are four sons, Rabbi Benjamin Plotkin of Jersey City, David George Plotkin, Morris Plotkin and Joshua Plotkin, all writers and lecturers; three daughters. Mrs. Flora Sherman of Manhattan, Mrs. Bertie Jerenberg and Mrs. Gertrude Froomess, both of Brooklyn, and seven grandchildren. Plotkin’s next book was Rage in Singapore: The Cauldron of Asia Boils Over and published in 1942. The Deseret News, (Salt Lake City, Utah), October 4, 1946, published the column by George Sokolsky who provided some background information on Plotkin and how he came to write the books, Rage in Singapore and The Plot Against America (1946). Sokolsky’s column prompted a response from the publisher, Sam Roth, who explained Plotkin’s role in his letter to the New York Sun, October 8, 1946. Plotkin edited two books in 1955: American Proverbs and Dictionary of American Maxims. Plotkin’s 1968 manuscript, The East Side Story, is in the collection of the New York Public Library. Plotkin passed away March 30, 1968, in Brooklyn, according to the New York Times; two excerpts. David George Plotkin, a poet and writer under the name David George Kin, died Saturday, near his home at 2214 64th Street, Brooklyn, his age was 68. ...Surviving are his widow, Rachel; three brother, Rabbi Benjamin of Congregation Emanu-El of Jersey City, Moses and joshua, and two sisters, Mrs. Flora Sherman and Mrs. Gertrude Froomes.